Ex-Ulster fly-half Ian Humphreys says the Aviva Stadium should "feel like a home venue" for the team's Champions Cup quarter-final against Leinster. The Irish provinces meet at the home of Ireland rugby in Dublin on Saturday. "If I was playing for Ulster I'd be more than happy it's at the Aviva rather than the RDS," said Humphreys. "You go to a ground like that and you feel a million dollars. Your chest goes out and you don't care who you are playing, whether you are home or away." "Ulster will feel like 'this is a venue in Ireland, this is a home venue for us' and they will be going there with a huge vocal support behind them. Their 20% of the crowd will probably make more noise than the Leinster support," added the former number 10. 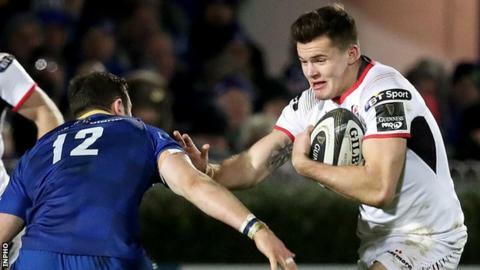 As Ulster target a first semi-final appearance since 2012, Humphreys believes that countering the threat posed by Johnny Sexton is key to any chance of success against the holders. "Ulster will be well aware that if you give Sexton too much time and space he will take you apart but if you put him under pressure and force him further and further back that is the pivotal point. "Johnny Sexton is the king at pulling holes and if players go on a head hunting mission on their own, shooting the line, he'll be pulling his wraparound plays, his short balls, his short kicking game, so Ulster need to temper their enthusiasm with discipline. "Get your width, then you can get your line speed - that's the message Jared Payne will be drumming into the players - but if boys start shooting out on their own then that's when there will be trouble. "I have no doubt Ulster are going to be up for this physically - it's just a question of whether they have the discipline defensively." Humphreys believes the potential selection of Michael Lowry at full-back in the absence of injured Will Addison and Louis Ludik would enhance the attacking options of his side. "When you go to play Leinster there's no point going there defensively. You need to have a real crack at them and picking someone like that at 15 gives you that opportunity. "With Addison not playing at 13 you kind of miss that second ball player. Whenever Michael Lowry or Rob Lyttle have a crack down the blindside, like they did against the Kings on Saturday, it takes a bit of the pressure off Billy Burns and it opens up so many more attacking opportunities." Former Ulster number eight Tony McWhirter, a member of the 1999 European Cup-winning Ulster side, believes a victory for Ulster would be "one of the biggest upsets in European Cup rugby in quite a while". "Surprisingly, Leinster have been a little off-form and were well beaten by Edinburgh last weekend, albeit without a lot of their first choice Irish players. "Ulster will be undaunted going down to play the European champions in their own back yard but it's a mammoth task ahead of them," said McWhirter. Former Scotland captain Budge Pountney, now a pundit for BBC Radio Ulster, says Ulster "will enjoy their underdog tag because it takes the pressure off them". "There are lots of boys with experience of big games in the Ulster dressing room and they will share that pre-game but also keep a lid on everyone's emotions. They will explain the need to get on with the job in hand."